Самолет CW-4 1933 года выпуска (иногда его именуют Curtiss T-32 Condor II) был еще большим анахронизмом, чем его тезка Condor 18, появившийся четырьмя годами ранее. Его единственным усовершенствованием стали основные стойки шасси, убиравшиеся в гондолы двигателей. Прототип T-32, двухстоечный биплан смешанной конструкции, поднялся в воздух 30 января 1933 года. За ним последовала партия из 21 серийного 12-местного ночного ("спального") пассажирского самолета класса "люкс". В последующие три года несколько T-32 регулярно выполняли ночные рейсы в авиакомпаниях "Eastern Air Transport" и "American Airways". Два модифицированных T-32 в качестве транспортных самолетов приобрела Армия США, она эксплуатировала их до 1938 года под обозначением YC-30. Десять T-32 были доведены до стандарта AT-32 и получили обозначение T-32C. В канун войны четыре T-32 летали под британскими регистрационными номерами, затем их поставили на службу британских ВВС. FINAL test flights have been completed with the Curtiss-Wright "Condor" bomber which Com. Frank Hawks is soon to demonstrate to the Chinese Government. This aircraft has been developed from the civil type "Condor," 32 of which were sold to air line operators in the U.S. and Europe during 1933. Welded chrome molybdenum steel is used for the fuselage, which is faired to streamline section and covered with fabric. The upper wing includes a centre panel which holds four 75-gall. fuel tanks and two outer panels. The wing construction is of welded chrome molybdenum steel tubing. Two spars of the Warren truss type with heat-treated flanges are used. The drag struts are of similar construction, and are bolted to the main spars. Ribs are of duralumin tubular construction and are placed approximately 10 in. apart. N.A.C.A. 2412 aerofoil section is employed. Frise type ailerons of high aspect ratio run for the full span of the upper outer wings, and are fitted with small adjustable auxiliary surfaces for any minor adjustments. In the wing and tail surfaces there are 125 inspection openings. The entire tail assembly, including tail plane, elevator, fin and rudder, is adjustable for incidence as a complete assembly. Connection between the tail unit and the fuselage proper is by hinged Fafnir ball bearing units at the end of the upper longerons. All control surfaces are balanced. In the extreme nose of the fuselage is the pilot's cockpit, which is fitted with adjustable windows. Tinted glass in the roof of the cockpit adds to the comfort of the occupants by eliminating glare. Included in the very wide range of instruments which is provided is a Sperry Artificial Horizon and a Sperry Directional Gyro. Two landing lights and one red fog light are located in the nose of the fuselage. Two Wright "Cyclone" R.1820 F.2 geared engines, developing 700 h.p. at 1,950 r.p.m., are fitted. N.A.C.A. cowlings are used with improved nacelles which extend 1 ft. to the rear of the trailing edge of the lower wing. 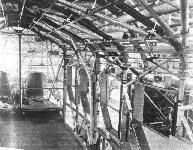 Two Curtiss electrically operated controllable-pitch airscrews, which have a diameter of 11 ft. 10 in., are fitted. It is claimed that this bomber is the largest land plane in the world equipped with a full retractable landing gear. This gear, when extended, has the appearance of a conventional fixed type undercarriage. There are three main members and only one of these is affected by the retraction. Only 28 sec. are required to retract or lower the undercarriage. In addition to the electrical drive there is an individual mechanism which may be operated manually by the pilot. The unusually large fuselage of the "Condor" bomber enables the aircraft to be used as a bomber, troop carrier or ambulance. Approximately 4,000 lb. 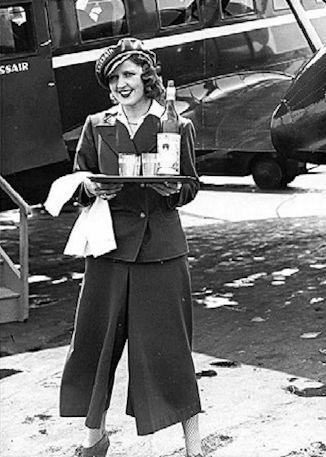 of bombs may be carried, two 1,100-lb. bombs in a compartment in the fuselage and the remainder beneath the lower wings. The heavier bombs are hoisted into place by a special Curtiss-Wright device. Five 0.30 calibre machine guns are carried, one in a turret in the top of the fuselage over the pilot's compartment, another midway between the trailing edge of the upper wing and the tail, one in the bottom of the fuselage and one on each side of the fuselage projecting through a sliding window. 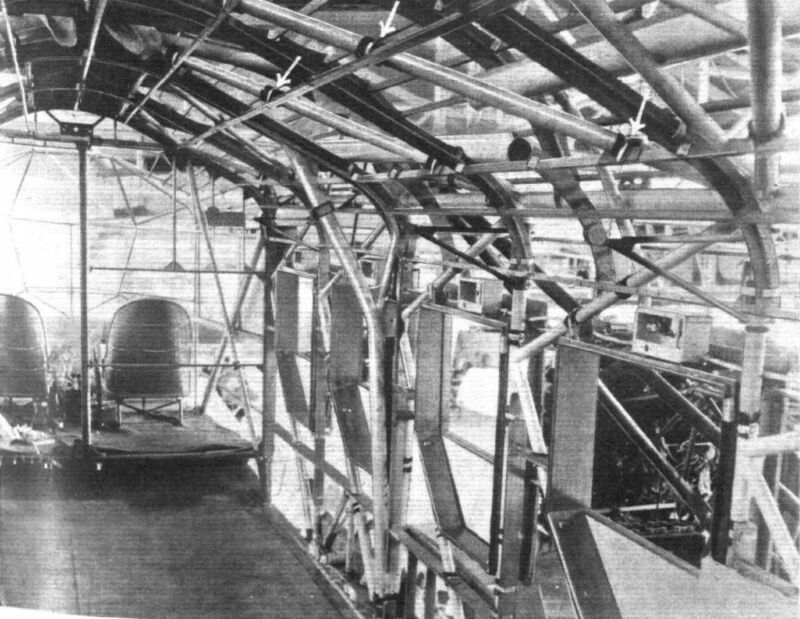 The bomber's compartment is located to the rear of the seat for the second pilot in the bottom of the fuselage. When used as an ambulance the machine will carry 12 stretchers. A large door is provided so that the wounded may be carried in and out of the machine with the greatest of ease. As a troop carrier it is equipped with benches and cushions for 24 soldiers with full field equipment. Lavatory accommodation is provided. Our readers should not confuse this aircraft with the old Curtiss "Condor" bomber which, for years, has been a standard type in the U.S. Army Air Corps. Take off with full load 16 sec. Один Condor построили с дополнительными топливными баками как дальний вариант для участия в антарктической экспедиции Берда 1933 года. Самолет отличался неубирающимся шасси, на которое могли крепиться поплавки или лыжи. 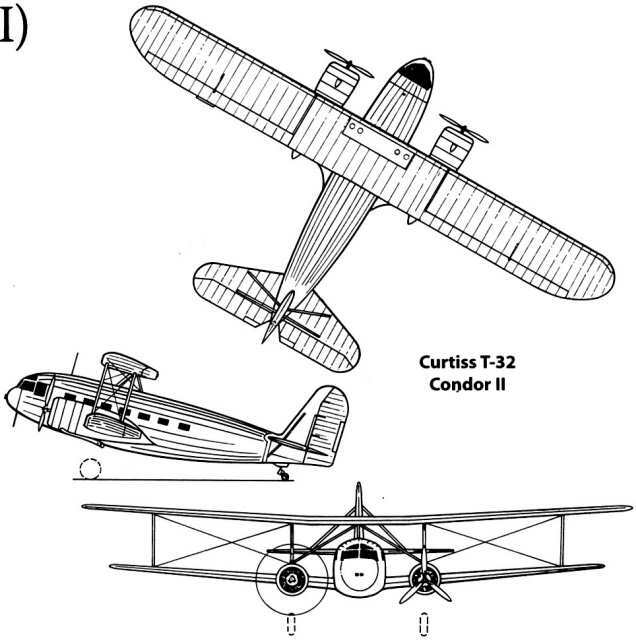 THE CURTISS "CONDOR": A commercial version of the American "Condor" night bomber. It has two 600 h.p. Curtiss "Conqueror" engines and is fitted with a Sperry "Automatic Pilot." Accommodation is provided for 18 passengers and a crew of 3. Its speed range is 57-139 m.p.h. OVER THE GRAND CANYON: A flight of Curtiss "Condor" Bombers of the U.S. Army Air Corps shown on their way over the Grand Canyon, North Arizona, to the relief of Navajo Indians who were isolated by heavy snowfalls recently. 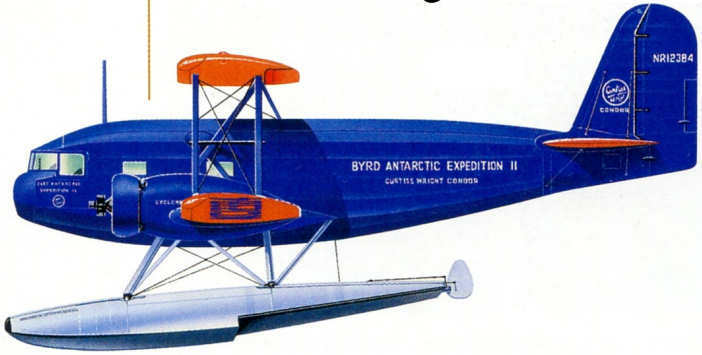 FOR THE BYRD ANTARCTIC EXPEDITION: The Curtiss-Wright "Condor," in which Admiral Richard E. Byrd will fly over the South Pole, flying over New York City. It is powered by two 700 h.p. Wright "Cyclone" engines, has a top speed of 170 miles an hour and a landing speed of 45 miles per hour. Red overall Curtiss R4C-1 9584 at West Base, Marie Byrd Land, 1940. 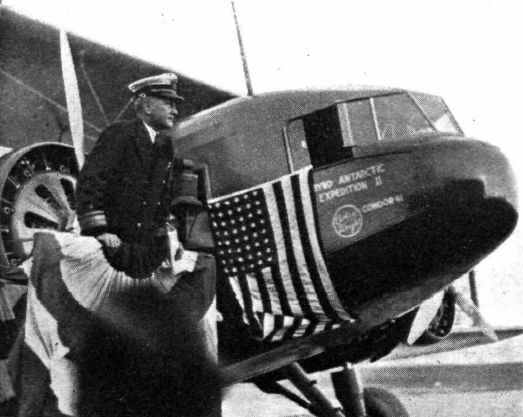 BYRD'S ANTARCTIC EXPEDITION: Rear Admiral Richard Evelyn Byrd tells his plans for the Second Expedition into the Antarctic wastes to an audience that gathered at the Boston Airport on September 29 for the christening of one of the Curtiss "Condors" he is taking with him. 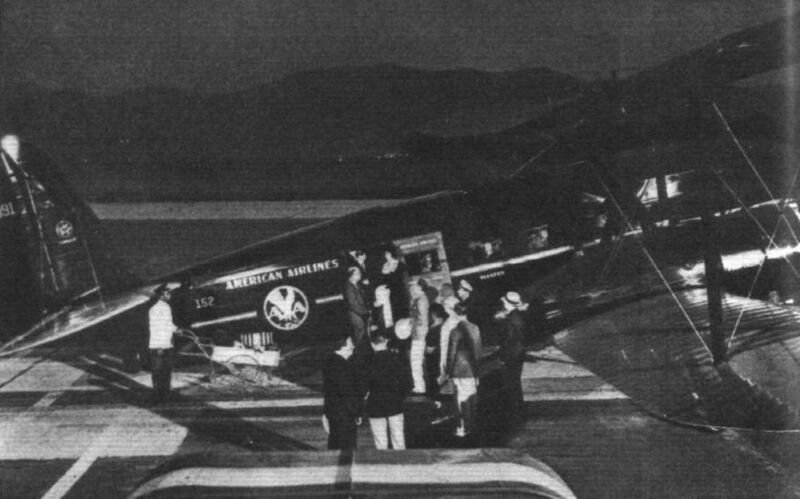 This plane, the William Horlick, has been named after one of the sponsors of the Expedition. 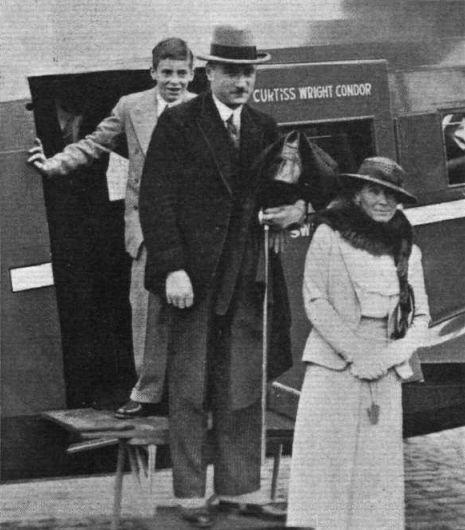 MONSIEUR LE PRESIDENT: M. Pilet-Golaz, the President of Switzerland, arriving with his family at Geneva in the Curtiss "Condor" of the Swissair Co.
FREIGHT ONLY: One of International Air Freight's Curtiss Condors on the tarmac at Croydon. These machines have been specially modified to take really large pieces of freight and to simplify the loading process. Стюардесса швейцарской авиакомпании «Swissair» на фоне самолета DH-89 «Дрэгон Рапид» (Curtiss AT-32C Condor II ???). Фото сделано в берлинском аэропорту Темпельгоф в 1934 г. 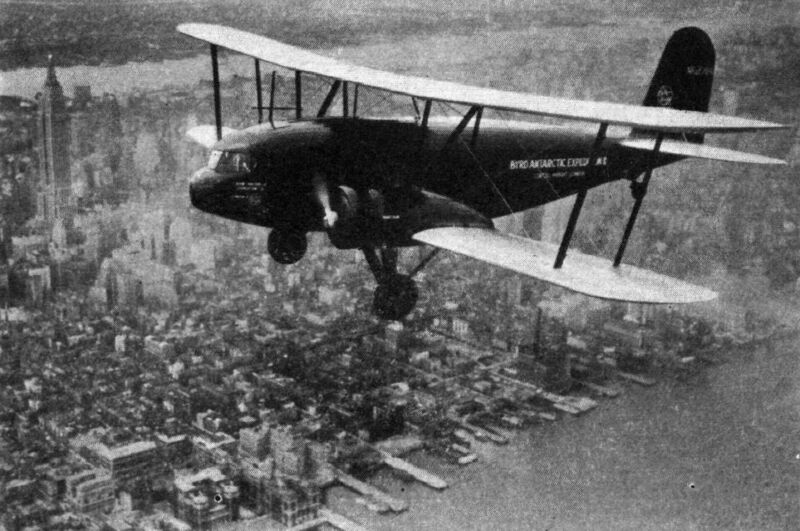 FROM PLOUGH-SHARE TO SWORD: The Curtiss-Wright "Condor" Bomber, developed from the commercial transport "Condor." 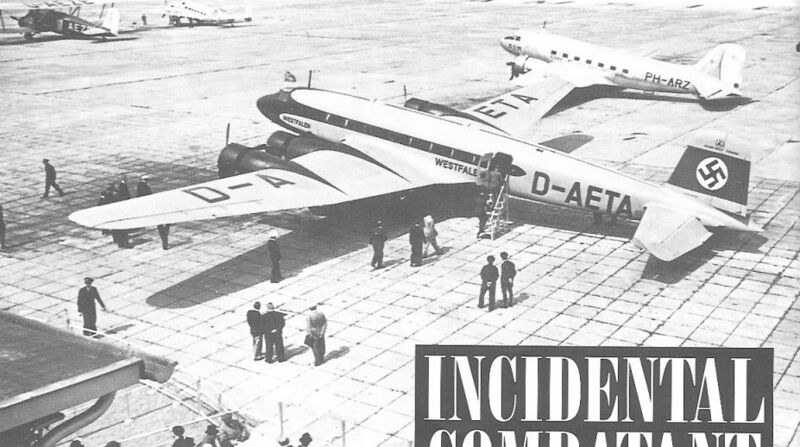 Ramp scene at Amsterdam-Schiphol June 25, 1938, dominated by Fw 200 V2 D-AETA ‘ Westfalen ’ of DLH. Alongside it is Fokker-assembled Douglas DC-3 PH-ARZ ‘Ijsvogel' of KLM. To the left is Curtiss T-32 Condor G-AEZE of International Air Freight and to its right KLM Lockheed Super Electra PH-APE ‘Ekster’. THE ILL WIND: A corner of Rollason's hangar at Croydon. In the foreground is a Stinson Reliant, with the little Latvian V.E.F. 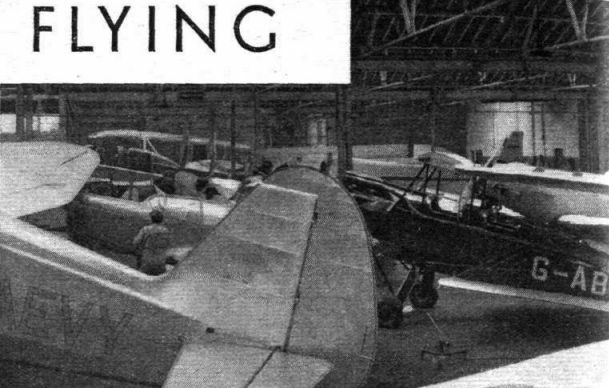 J.12 behind it and the South African Junkers Junior on the right. One of I.A.F. 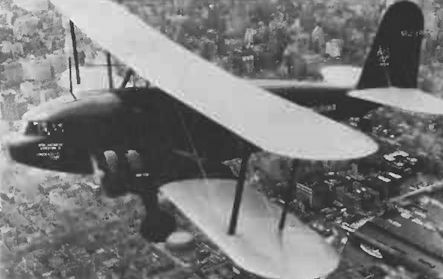 's Curtiss Condor freighters can be seen in the far distance. 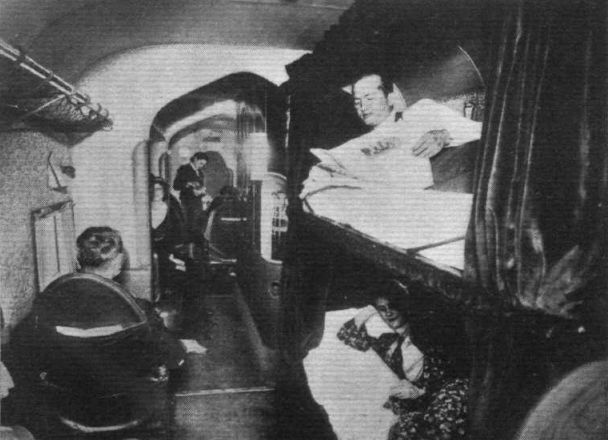 AN AERIAL SLEEPER: The sleeping accommodation provided by Eastern Air Transport on one of their Curtiss "Condor" airliners. 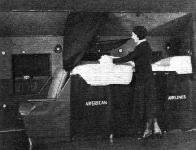 DAY AND NIGHT: Two interior views of the Curtiss-Wright "Condor" airliner, showing the convertible sleeping berth arrangement, which forms a feature of the new fleet of machines to be put into operation by American Airways between Dallas and Los Angeles.